Again Glocks are very nice but they aren't the only reliable well made guns on the market. I have a 43. Mine looks a lot nicer than theirs. Imo, no one makes things better than the Austrians. Doesn't matter what it is. Glock, KTM motorcycles, and my Silhouette glasses. Now if I could only get an Austrian made truck and boat motor. Right! Glocks are squarish, gugly and plastic water pistol looking. I'm staying with my cz's!! I have a Springfield, like it better than a Glock. If you want a CZ design in a fine quality gun, get a Sphinx! 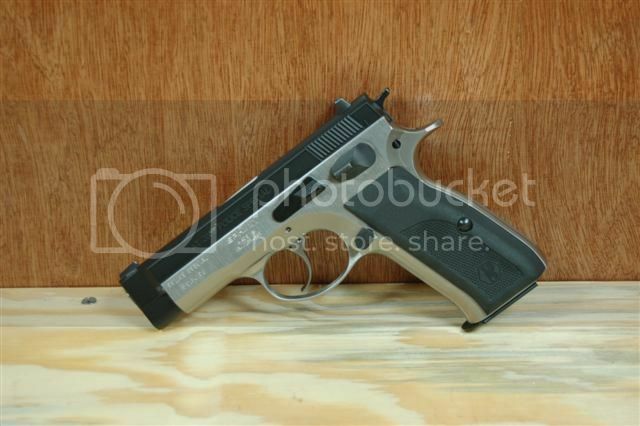 Or, if you just want a plain Jane CZ, get one of the Dan Wesson series. Last edited by Shag; 07-08-2015 at 04:12 PM. Same here Leeroy. Just dressed her with some Trijicon HD's. Wish they'd stop coming out with new models. Reasons to buy a GLOCK. Well because its a Glock that's enough reason. I use a Glock 22 for my on duty weapon and us a Glock 23 as a off duty weapon. Glock is fool proof. Sorry, I wouldn't own one even if it was given to me. Flame suit on! I am not against Glocks but as soon as I bought an HK I never looked back. I have the hk45c and p2000sk, love them both. An H&K P2000SK in .40 is my EDC. Also the factory has tested Glocks well past 100K rounds with no cleaning and being abused along the way. They have been doing this for years.. I like this guy, the crazy Russian. Doesn't practice the same safety protocols as I do, but he is funny!